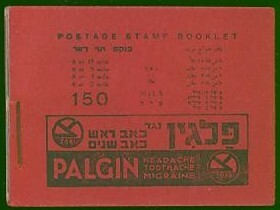 The Palestinian postal authority issued three different stamp booklets between 1929 and 1939. They can be differentiated beyond the actual contents of stamps, by the colour of the cover, the advertisements and tariff details. All booklets contain exclusively stamps from the 1927 definitives ("Pictorials") in panes of six (3x2). The stamps were mounted, in upright or inverted position, using sheet margins or gutters. The panes of stamps are separated by interleaving pages, either blank or with advertisements. Apart from the very first version, which exists stitched, all are booklets stapled. The stamps used are from the regular production and show the same variants in colour shading and plate varieties from paper types B (thick, vertically laid/ribbed) and D (thick horizontally laid/ribbed). Every booklet exist in more than one version. They can be identified by the advertisements, texts and tariffs on the covers and the interleaving pages. Stanley Gibbons lists five booklets, differentiated by their covers. Specialized catalogue Bale Mandate however sets out three main versions differentiated into nine, five, and two variants, respectively. The first booklet, issued in 1929/1930, has a blue cover and 10 interleaving pages. It contains seven panes of six stamps each: two panes of value 2m, two panes of value 3m, and three panes of value 5m. The total value was 150m. Apart from the regular version (stapled) it exists also stitched. 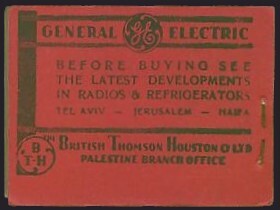 The second booklet was issued with a red cover in 1937 and a blue cover in 1938. It contains seven interleaving pages and four panes of six stamps each: one pane each of values 2m, 3m, 5m, and 15m. The total value was unchanged at 150m. The third booklet, issued in 1939, has a pink cover and six interleaving pages. It contains three panes of six stamps each: one pane of value 10m, and two panes of value 5m. The total value was reduced to 120m. Example of booklet Bale no. B8, SG no. SB2. Images courtesy of Ebay, where it was sold in February 2006 for $4,125.95 (ca. € 3,430).